Any day now, New Yorkers could lose 90 per cent of their water in a New York Minute. The water might not just be undrinkable: you might not even be able to use it for washing vegetables, brushing your teeth, or taking a shower. Going by experiences in other parts of the country, it might smell so bad you couldn’t let it run; it might be brown and oily; it could contain such volatile compounds that your water might actually catch fire. It wouldn’t be a terrorist attack. It would be a careless moment or an unforeseen rock fracture that sends millions of gallons of water tainted with highly toxic and volatile drilling chemicals into the pure, unfiltered water of New York City’s biggest aquifer. That pristine source, the Delaware/Catskill aquifer, sits cradled in the hills of several southeastern NY State counties that form our most important watershed. Unless a “Kill the Drill” action proposed by Manhattan Borough President Scott Stringer and other environmental groups gets enough traction to stop them, gas companies will be able to drill right into the watershed. Although they use toxic chemicals that have contaminated water supplies from Colorado to Pennsylvania, NY State’s Department of Environmental Conservation (DEC) has issued an environmental impact statement that could permit the gas companies to drill with impunity. The City’s Delaware/Catskill watershed west of the Hudson sits above the Marcellus Shale, a vast expanse of compressed rock created millions of years ago that extends from Virgina into southern New York State. Its northern end underlies 28 counties in the State’s southern tier. 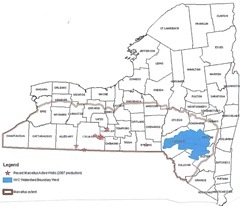 Our watershed only covers the tip of the shale’s northeastern tongue, leaving some 18 NY State counties to access the shale. Nevertheless, the State’s DEC is proposing to allow drilling in almost 70 per cent of the watershed and put the city’s water at risk. The gas doesn’t sit in deep caverns as you might imagine. It is distributed throughout the shale in small pockets and fissures. To extract it, the drillers use a process called ‘hydraulic fracturing,’ by which vast quantities of water laced with highly toxic chemicals are forced down into the shale under thousands of pounds of pressure to break the rock and release the gas. Last week the DEP held its first hearing on their statement at Stuyvesant School in Tribeca. Over 250 people showed up. One hundred sixty of them signed up to address the issue. Many of them demanded that the DEP extend its time for public hearings on the statement well into next year. Several speakers tore into the 183-page statement as being primarily a product of the mining industry. One speaker even pointed out that the logo of Chesapeake Energy Corporation was still visible on one of the pages. The hearing period has so far only been extended to December 31st, but it is expected that it will be extended. The pressure to drill is enormous. Aside from the possibility that it will create jobs in areas hard-hit economically, the lure of a local gas supply for the Northeast and the potential for an estimated $1 Billion flowing into the State’s treasury each year are politically hard to resist. But the alternate realities are daunting. A gas well using hydraulic fracturing requires millions of gallons a day, with the potential to deplete water needed by surrounding homes, farms and towns. This raises the question, “Where will the water come from?” This spring, the Pennsylvania DEP shut down two drillers who were drawing millions of gallons from local creeks without any kind of permit, impacting local farms, businesses and homes. Another question is: where will the millions of contaminated waste water go? Because it is too toxic to be handled by municipal waste water systems, most of it is stored in retention ponds. On several occasions, these have leaked or caused massive spills of their hazardous contents into the surrounding areas. But these pods pose a danger even if they don’t break. In August, the department of Justice fined Exxon-Mobil for extensive bird kills. According to the Department’s Justice News, the birds died after exposure to hydrocarbons in uncovered natural gas well reserve pits and waste water storage facilities at Exxon-Mobil sites in Colorado, Wyoming, Kansas, Oklahoma and Texas. One of the biggest problems is that the gas companies have been able to keep the identity of the toxic chemicals they use for drilling a secret. The chemicals are added to make the pressurized water mix react more powerfully when it’s shot into the shale. So far, every company has claimed that the chemicals they use are proprietary and have refused to identify them. As a result, when a toxic chemical causes harm, it can’t be attributed to the company drilling nearby, and even companies who have paid damages for their spills have been able to avoid claims attributing the physical or ecological damage to their chemicals. The problem is embedded in the energy act passed in 2004 that said hydraulic fracturing could not be held liable for water problems occurring in the locality of gas or oil drilling. Congress passed this bill in part because the EPA under Bush and Cheney had declared that the process posed no risk to drinking water. The Obama administration has not addressed either the Act or the determination.